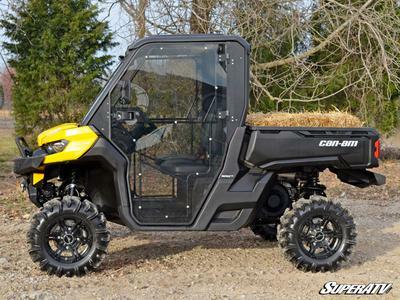 Keep the elements out and your comfort level high with our Can-Am Defender Full Doors and Cab Enclosure Components. The full selection of components provides the protection needed to keep you and your family out of the wind, rain, and snow! Whether you want to get out on a trail or need to get some chores done, you can feel confident that you're guarded from the elements with our cab components. The sleek design features lightly tinted 1/4" abrasion resistant Makrolon AR material, giving you a worry free ride when blazing down the trail. Each door features a carbon steel frame that provides strength and integrity to the door without compromising style. Our doors come with a rubber seal for a rattle free finish. Will work with OEM Roof and Front and Rear Windshields. As no detail was spared, these rugged doors gives the driver a full 360 degree view. To ensure ultimate comfort, the ergonomic handles are strategically placed to prevent unwanted banging or bruising of the knee. Help protect you and your passenger from sticks and other flying debris while blazing the trail with our windshields - the best off-road windshields on the market. Each windshield features a super tough polycarbonate construction with a bottom seal that’s contoured to your ride’s design. Our 1/4” thick AR Makrolon is much stronger than your average UTV windshield. We’ve also beefed up the scratch resistance by hard coating this windshield on both sides for years of use. All our windshields come complete with hardware and instructions needed to make installation a breeze. Proudly manufactured in our facility in Madison, Indiana. The separate upper sliding vents allow even further airflow and is tinted to act as a sun visor. These vents can be controlled separately to act as a dual climate control. Kit only includes doors if you don't select windshield options.